Turnips, beets, and carrots put in early were successful and achieved harvestable sizes before the weather got too hot. Onion seedlings and sets were fast growing and an excellent crop. Spring crops in May 2018 at the Organic Vegetable Garden. Tomatoes and beans did not set when both daytime and nighttime temperatures were high. The heavy rains leached nutrients from the soil. Beds tested low for potassium. Nitrogen may have been low as well. This is a hunch as Virginia Tech does not test soil for nitrogen. Some crops suffered from more fungal diseases as a result of the constant dampness of the soil. Rust appeared earlier on some beans. Phytopthera appeared in the sweet pepper beds late in the season. 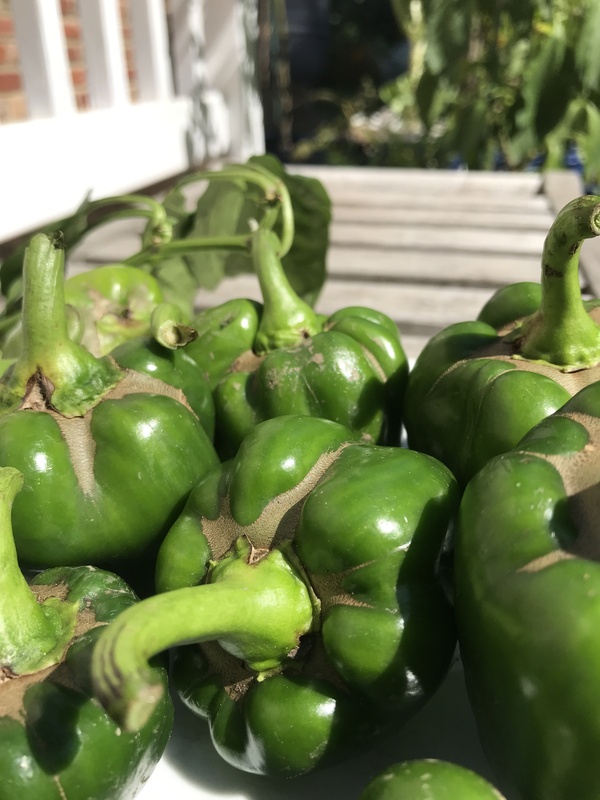 Mite damage was aggravated by dampness and heat reduced sweet pepper production. Mite damage on green peppers at the Organic Vegetable Garden. Hot peppers thrived all summer, remaining productive until a killing frost in November. Some garlic varieties produced multiple shoots and small heads rather than a single large head because of the alternating warm and cold weather throughout the winter. The type of changes chronicled by the Extension Master Gardeners at the Organic Vegetable Garden will continue as climate change impacts our region. One of the many such changes is the increase in warm nights. 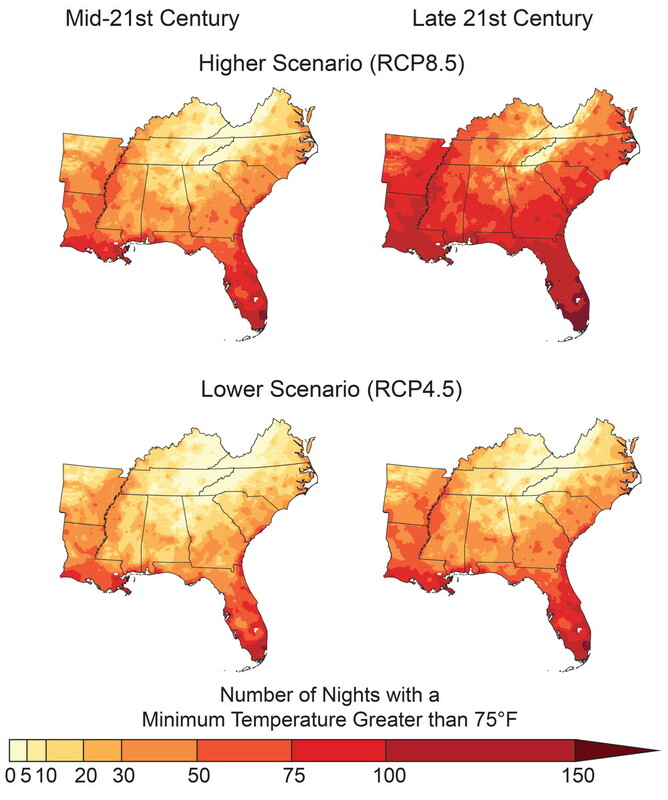 The maps below show the projected number of warm nights (temperatures above 75°F) per year in the Southeast under lower and higher emissions scenarios for the mid- and late 21st century. In plants, increases in the number of warm nighttime air temperatures can affect respiration, pod set, pollen viability, plant growth and crop yields. This entry was posted in climate change, Organic Vegetable Demonstration Garden, Public Education and tagged climate change, Extreme weather., Organic Vegetable Garden, warmer nights. Bookmark the permalink.